This 16" USB-powered monitor is your reliable, ultra-thin portable display that requires no external power cord. Powered from the USB port of your laptop or PC, the lightweight 16" USB monitor is ideal for presentations and dual monitor displays. It comes with an attractive piano-black glossy bezel and a smart stand that allows for easy landscape or portrait viewing. The Portable USB Monitor has a foldable smart flex-stand for viewing in landscape or portrait mode. Landscape mode is ideal for presentations and Excel sheets, while the Portrait mode conveniently gives you an easy vertical view of your instant messaging program, or sidebars such as search results. This monitor has the unique pivot feature that automatically adjusts the image according to the display's orientation, so you will never change settings as you switch between landscape and portrait mode. Designed with a piano-black glossy bezel, the USB monitor has a 15.6" diagonally viewable image, this monitor offers a 500:1 contrast ratio, 5ms response time, and a 1366 x 768 resolution @60Hz. It's ultra lightweight for great portability, making it perfect for business presentations, the frequent traveler, photo frame applications, and dual monitor setups on-the-go. 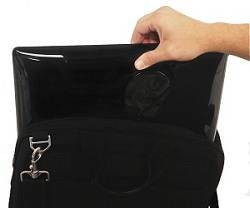 The Portable USB Monitor is the solution for the frequent traveler who needs to pack multiple displays, as it easily fits into any 15" laptop bags or backpacks. If necessary, multiple USB monitors can be simultaneously connected to a laptop to function as a multi-monitor PC, thanks to the built-in DisplayLink USB graphics. Simply installing DisplayLink software on the PC allows you to easily add multiple USB monitors for external displays without unnecessary extra hardware. 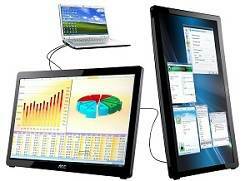 The Portable USB Monitor gives you multiple external displays for your laptop without any complications. The monitor works wonderfully with my laptop. It reduces my work time tremendously. It fits perfectly into my laptop bag with it's cover. Wish I would have ordered one a long time ago. Ok, so a little dramatic, but I had been carrying a 15” TV, extension cord and HD cables in my bag, and with this monitor I was able to get rid of the tv and HD cable and greatly reduce my bags weight and size. Oh, the tv I was carrying I had to unscrew the stand so that it would fit in my bag. The built in stand is awesome. This product is great. Easy set up and clear picture. Glad I found it. Makes work at home much easier. After breaking my MacBook Pro screen and finding out it would cost $5oo+ to repalace it, TekSpree came to the rescue. For 1/5 the price I can continue to use my MacBook with very little inconvenience. Installing it without a screen was not possible, but for $40 our local geeks were able to do it, no problem. So far, TekSpree has come through. Very convenient, and easy to set up. I work at home, and it's really ideal for me to be able to review and draft at the same time. As a very discriminating technology user and buyer, I can't believe anyone would give this less than 5 stars. It is a large, portable LED display that requires only a USB connection for power and video. It works perfectly for me. Due to the size, which is a huge positive, it is also not the most portable. However, it does fit into my briefcase/laptop bag if I need it. Also, it has a glossy black frame and housing, which is a fingerprint magnet.The stand, which rotates for landscape or portrait mode, is very solid. The light weight nature of the screen is also a plus. Click the button below to add the Portable USB Monitor for Laptops to your wish list.